Photo by Allyson Stone / Dr. Jay Telotte has authored numerous books on his research interests, which range from science fiction to Disney Studios. The Film and Media Studies minor offered by the School of Language, Media and Communication (LMC) gives students the chance to explore their interests through the subject’s broad historical, theoretic and cultural context. The minor requires six three-hour courses and is open to all majors. Open to students of all majors, the minor requires the completion of six three-hour courses, with the only prerequisite being English 1102. Course options include classes in Video Production, Global Cinema and Documentary Film. 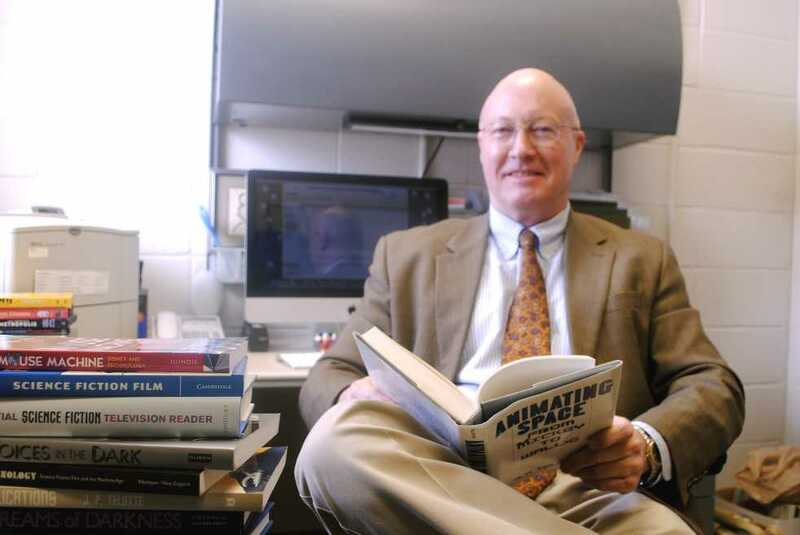 LMC professor Dr. Jay Telotte was hired at Tech in 1979 to help introduce film studies into the English department’s curriculum. In the years since, the concentration has expanded to include the range of different media studies topics taught by LMC professors today. Dr. Telotte currently teaches a Film & Television course, as well as a Special Topics class in Film Animation. These and past courses have allowed him to explore his research interests, which include film history, science fiction and Disney Studios, with his students in a process that he describes as a learning experience on both sides. “Because of the flexibility of being able to create new classes and teach practically anything I was ever interested in at the undergraduate level and the students’ interests in a variety of areas, we’ve been able to bring in additional dedicated film scholars and other people who work tangentially to enrich the program,” Dr. Telotte said. An example Dr. Telotte gave of such a professor was Dr. Michael Nitsche, whose field is in Digital Media but also does some film production work with the program. In his Construct-Moving Image course, students can consider film, video and animation through emerging digital forms. One of Dr. Telotte’s former students Ben Callner, who graduated five years ago, has been receiving attention recently for his “Goat 4 Sale” Doritos commercial that was selected through a national contest to air during the Super Bowl earlier this month. Other students who have taken courses for the minor during their time at Tech have also pursued directing after graduation, such as Brad Tucker, who won the national Campus Movie Fest award and was admitted to the American Film Institute’s Graduate Directors Program as a result. Media Studies is an exciting interdisciplinary field. Rebecca Rouse, a PhD candidate for the MS in Digital Media, teaches the Intro to Media Studies course for the minor. Her aim for the introductory class is to make the material accessible to students of any major, and to allow their individual interests to guide their projects in the same way that she has been able to pursue her passion through the Master’s Program. “I feel incredibly lucky to be able study [digital media] as a PhD student here, because frankly there wasn’t any other program when I was looking for school where I could do what I wanted to do except for Tech. My interest is in new technology on stage, and the digital media program here is really terrific for giving us a lot of freedom with what we want to pursue,” Rouse said. The introductory courses for the minor are often taken by CM majors because the class is required for their degree, but Rouse has consistently seen mix of students—freshmen through seniors—from many different majors. She feels that this variety enriches the course by providing an opportunity for varied discussion, and tailors the material to this idea. “I hope to show students through my course that Media Studies is a very exciting field because of its interdisciplinary nature. We cover a wide spectrum of topics so that each student can find something that [he or she] can get excited about. Every project is also collaborative, and I love seeing both artists and engineers at this school coming together in this way,” Rouse said. Opportunities to gain practical experience are strongly encouraged. While not required, opportunities to gain practical experience are strongly encouraged in the minor. Dr. Angela Dalle Vacche’s six-week Italian Film Studies program takes students to northeastern Italy and the surrounding regions to learn and apply the fundamentals of filmmaking to their own Italian movies. “We emphasize the technological language of cinema because it is a hybrid medium. Our students do not take film appreciation, but we have a curriculum of really serious classes about what cinema represents for the twentieth-century…so that we might be in a better position to understand the changes brought about by innovations,” Dr. Dalle Vacche said. The cultural context found in the study abroad program, as well as other courses offered, such Dr. Qi Wang’s Asian Cinema Studies, is considered a vital part of the minor. “We live in a global society dominated by many different kinds of images. Students who wish to pursue a minor in Film Studies are likely to do well if they are visually curious and open to learning about different worldviews,” Dr. Dalle Vacche said.